Nestled at the edge of the Okefenokee Swamp in the southeast corner of Georgia, Waycross emerged as a commercial hub of the local timber industry that grew out of the cypress wood harvested from the swamp. In 1874, it became the seat of Ware County after the railroad was built through the town. It developed economically due to its location at the confluence of nine railroads and five highways, which also gave the town its name. As Waycross grew, a small number of Jews began to come to the area seeking to take advantage of the town’s economic opportunity. Perhaps the first Jew to live in the area was Alex Gilmore, who left Russia in 1900 when he was only 14 years old. By 1902, he had settled in Blackshear, just next to Waycross. By 1910, he owned a dry goods store in Blackshear and had earned enough money to bring over his two of his siblings and his widowed mother, all of whom lived with him. Harry Weisser was an Austrian immigrant who lived in Waycross by 1910, working as a watchmaker. By 1920, he owned his own jewelry store in town. Gilmore and Weisser were soon joined in the area by a number of Russian Jewish immigrants who owned stores in Waycross. Morris Jacobson was born in Lithuania, before immigrating to the United States and settling in Moultrie, Georgia, where his cousin lived. After traveling the area as a peddler, Jacobson opened a store in Waycross in 1923. Jews also settled in the small towns around Waycross. Nathan Cohen came to Nicholls, Georgia from Poland in 1913, when he was just a boy. After peddling around the area for a few years, he was able to save enough money to bring over his mother and sisters from Poland. 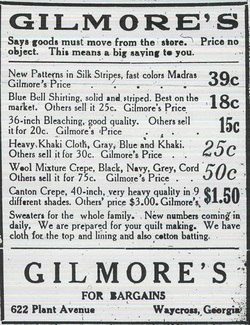 By 1924, he had moved to Alma, where he opened a dry goods store, Cohen’s, which is still owned by the family today. Of the Jewish immigrants who initially settled in Waycross, few set down deep roots in the community. 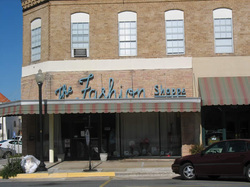 Henry Friedman was a shoemaker who came down to Waycross from New York with his family and opened his own shop by 1910. Herman Katzif left Russia in 1908, and was also a shoemaker in Waycross 1910. According to the 1912 city directory, there were 18 Jews in Waycross who were involved in commercial trade, either as dry goods merchants, shoe makers, or tailors. By 1921, all but three of these Jewish immigrants had left Waycross. Of those who could be found in the census, most had moved to other cities in Georgia. In 1920, Henry Friedman was living in Atlanta, while Herman Katzif was in Cordele. Only four Russian-born Jews lived in Waycross in 1920: Barnet and Sophia Salzman, who owned a grocery store, and Harry & Rose Yermovsky, who owned a dry goods store. Despite the extreme level of population turnover, the Jewish community of Waycross began to organize in the 1920s. In 1920, Jews in the area first gathered to pray together. Four years later, 13 men officially organized a congregation, with Alex Gilmore as its first president. All but one of these founders were immigrants from Russia or Poland. Half of them owned dry goods stores, though their numbers also included peddlers, store clerks, and a lawyer. A number of them were relatively recent arrivals in town; two had come to Waycross from Savannah and one from Brunswick. In 1924, Waycross Jews traveled to Valdosta or Brunswick for the High Holidays; the local newspaper noted that the Jewish merchants in town closed their stores for the occasion. In the congregation’s early years, they met at the local Moose Hall; between 1926 and 1953, they rented space in the Knights of Pythias Hall on Plant Avenue. Alex Gilmore bought a Torah for the group in the 1920s; the Gilmore family donated a second Torah to the congregation in 1935 after Alex’s death. The congregation would often bring in visiting rabbis to lead services on the High Holidays. From 1935 to 1937, a Rabbi Schlossbery would come to Waycross regularly to help teach the children of the congregation. Morris Jacobson replaced Alex Gilmore as leader of the congregation, serving as president from 1934 to 1954. By 1937, 47 Jews lived in Waycross, and they began to discuss the possibility of building a synagogue. Due to the effects of the Great Depression, the congregation had to postpone their plans for a permanent home. Finally, on May 22, 1952, the congregation broke ground on the Waycross Hebrew Center on Screven Avenue. Morris Jacobson was the head of the fundraising committee. They were able raise money from local Jews, family members who lived in other cities, Jewish-owned wholesale firms in other cities that did business with the area’s Jewish merchants, and local Gentiles. When the synagogue was dedicated in the summer of 1953, the congregation held an open house in which their non-Jewish neighbors were invited to tour the synagogue and learn about Judaism. The members of the Waycross Hebrew Center welcomed the larger community “to express publicly our appreciation for the wonderful cooperation shown in our building program.” Local Christian ministers announced the open house from their pulpits and encouraged their members to attend. Rabbi Abraham Rosenberg of Savannah was the keynote speaker at the dedication, which drew a large crowd. The synagogue was dedicated in honor of Alex Gilmore, who had been the leader of the local Jewish community until his death in 1934. The Waycross Hebrew Center was built in the new Cherokee Heights neighborhood, where many of its members lived. This enabled more observant members to walk to the synagogue on Shabbat and the High Holidays. The congregation was Conservative in practice, though it has never officially affiliated with any of the Jewish movements. A kosher kitchen was maintained in the building, even though most members did not keep kosher at home. For some members, walking to shul was not possible, as the Waycross Hebrew Center attracted Jews from several of the small towns in the area. At the time of the synagogue’s dedication, members lived in Alma, Blackshear, Douglas, Homerville, Jessup, and Baxley, in addition to Waycross. Soon after the congregation settled into its own building, members discussed hiring a full-time rabbi to lead the congregation, but came to the conclusion that it was beyond their financial means. In 1961, they made an arrangement with the Jewish congregation in Valdosta, in which their rabbi, Samuel Zakuto, would drive the 60 miles to Waycross each week to teach Hebrew to the children in the religious school. Rabbi Zakuto also officiated at the Waycross congregation’s lifecycle events. He served the congregation into the 1970s. Since then, Waycross has relied on student rabbis from the Jewish Theological Seminary for the High Holiday services, and lay readers for the rest of the year. The Waycross Hebrew Center has never had a full-time rabbi. 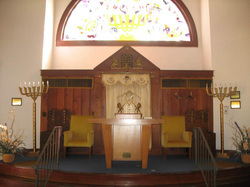 In 1928, four years after the congregation was founded, 20 Jewish women in Waycross established a Sisterhood, which they called “Daughters of Abraham.” Although the congregation was unaffiliated and Conservative in orientation, the Daughters of Abraham joined the Reform National Association of Temple Sisterhoods, although they dropped their membership in 1950 as they felt they weren’t getting enough benefits from the dues they had to pay. The Sisterhood focused primarily on charity work. During World War II, the group sent food and clothing to those suffering in Europe. In 1948, the Sisterhood received a special citation for collecting over 2,300 lbs of relief supplies for war refugees in Europe. In addition to helping others, the Sisterhood also raised money through garage sales and dinners to help improve the Waycross synagogue. The group also oversaw the congregation’s religious school until Rabbi Zakuto started coming up from Valdosta. 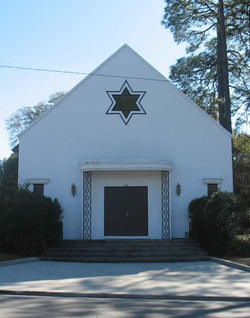 In addition to the congregation, Waycross Jews had a short-lived B’nai B’rith chapter. Founded in 1947, the David Emanuel Lodge sponsored a soil conservation contest to encourage farm youths to learn modern ways to avoid soil deterioration. In 1954, the chapter began giving the annual Morris Jacobson Brotherhood Award to a local citizen, either Jewish or Gentile, who had worked to foster the spirit of interfaith friendship in the community. Ironically, the chapter disbanded in 1959 to avoid being associated with the pro-civil rights stand of the national organization of B’nai B’rith. Waycross Jews feared that this institutional support for integration threatened their own acceptance in the community. The disbanding of the local B’nai B’rith lodge did not have a significant impact on the Jewish community. All of the lodge members belonged to the Waycross Hebrew Center, and most of the lodge’s activities now took place under the auspices of the congregation, including the Morris Jacobson Brotherhood Award, which is still given out annually. In the early 1960s, Waycross Jews founded a Young Judea chapter to serve the teenagers in the congregation. Its main appeal was the regional events where young Jews from Waycross got to socialize with Jews from other cities in the region. Young Judea was Waycross’ only Zionist organization, though its activities were more educational and social than political. Nevertheless, Waycross Jews supported Israel, raising over $3000 for the Jewish state during the 1967 War. Despite this decline, the small but close-knit membership of the Waycross Hebrew Center has persevered and continues to hold weekly lay-led Friday night services. About 11 or 12 members regularly attend with some driving as much as 70 miles to get to Waycross. If the congregation can not make a minyan, they hold an abbreviated service, omitting those prayers that require ten people. They still bring down a student rabbi from the Jewish Theological Seminary for the High Holidays, which drew 50 worshipers on Rosh Hashanah in 2008, as several family members who have moved away came back to Waycross for the occasion. Their synagogue’s kitchen is still kosher, and the members bring in kosher meat from Jacksonville for special events. Donations from people with Waycross roots who live elsewhere have helped keep the Waycross Hebrew Center in operation.